Group transfer polymerization (GTP) was announced 20 years ago by DuPont as a method for synthesis of acrylic block polymers. It operates at high enough temperatures to allow reactor cooling by water-cooled reflux condensers, rather than more costly refrigeration units. GTP uses 1-methoxy-1-(trimethylsiloxy)-2-methylprop-1-ene (MTS) as initiator and a carboxylic acid salt as catalyst. The number of growing polymer chains corresponds to the amount of MTS used. Chain growth stops when the monomer is depleted. Addition of a new monomer at this point starts chain growth again to produce a block polymer. DuPont sells pigmented inks containing GTP block polymer dispersing agents. Initial mechanism studies pointed to a trimethylsilyl transfer process that now appears to be incorrect. Strong evidence is presented for a dissociative anionic process. Reactivation of silylated chain ends by the alkoxide eliminated during end group cyclization is proposed as the reason GTP works at 80 °C. 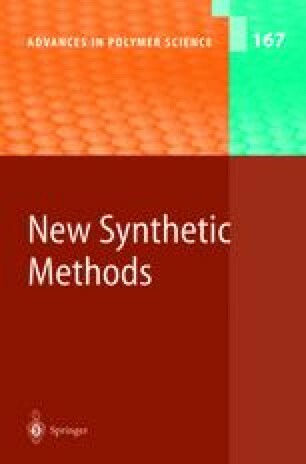 A comparison of GTP with other methods for block polymer synthesis is presented. The bulk of the DuPont work described herein was conducted by research workers in the Automotive Finishes and Central Research Departments. I wish to especially thank Dotsi Sogah, Wally Hertler, Bill Farnham, T.V. RajanBabu, and Professors Jack Roberts and Barry Trost for many hours of discussion on various aspects of GTP technology.